The Hope Chest publishes … TOMORROW! Every time I have a book launch, it feels surreal, dreamlike. It stops me cold and makes me revisit not only how the book got to this point, but also how I got to this point. Have you seen LaLa Land? Near the end of the movie, Emma Stone’s character – who is about to give up on her dream of being an actress – nabs one last audition. Rather than reading for the part, casting asks her to tell a story, and she sings a number entitled Audition (The Fools Who Dream). It is a stunning number – lyrics filled with the fears, shattering rejections and yet undeterred hope that every artist experiences in his or her career – and it touched me so deeply that I began to weep. So loudly, in fact, that many in the theatre turned around to see if I was okay. I have been where Emma Stone’s character was many times in my career, on the verge of quitting, of thinking that my dreams of being a writer were simply pipedreams. I have been consumed by fears of failure, that I wasn’t good enough, that I wouldn’t make it, that somehow this dream just wasn’t meant to be for me. But something deep inside me always urged me on, sang to me, just like it did to Emma Stone. It was fierce determination and a bit of madness, of course, but most of all it was hope. Hope that I could make the world feel, think and see just a little bit differently from my words. I am so, so proud of The Hope Chest, which – like The Charm Bracelet – is inspired by my grandmas’ heirlooms, lives, lessons and love. It, too, is meant as a tribute to our elders, whose sacrifices made us who we are and whose stories are all too often overlooked. It’s about the unconditional love and support of family, and I hope it will remind you that hope can be found where and when you least expect it. The story found in The Hope Chest is told by three people: Mattie is a fiercely independent woman battling ALS; Don, her devoted husband, who is facing a future without his one true love as their 50th wedding anniversary approaches; and Rose, their caregiver, is a young single mother trapped in her life. Each of them has lost a part of themselves until one woman’s heirloom hope chest is rediscovered, along with its contents and secrets. As their hearts heal, hope finds its way home again. This book is deeply personal: Mattie is inspired by my uncle’s courageous battle with ALS, and Rose’s relationship with Mattie and Don is based on my relationship with my father’s caregivers during the final years of his life, strangers who have now become family to me. Writing about ALS was not easy. I wanted to portray the horror and reality of the disease as honestly as I could, from the perspective of those suffering from the disease as well as those who love and care for them. I pray there is an end to this terrible disease one day, and – if this has affected someone you know or love – I urge you to consider getting involved with or contributing to the ALS Association, or your local ALS chapter. 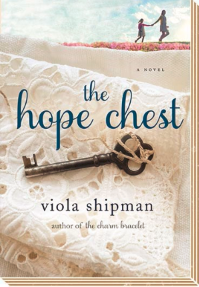 You can see more about what people are saying about The Hope Chest on my website here or here on Goodreads..
Read on for a giveaway, a beloved recipe and more! The winner of our last contest for a cedar hope chest, books and two of my family heirlooms was Denise from Hillsboro, OR. Thank you for reading, and may I ask you to share this newsletter with other readers who you think may enjoy it? Here’s to hope! Share your photos on social media to spread the word, share the love and win! The treasures my grandmothers placed in their hope chests mean so much to me and have inspired my new novel, The Hope Chest. I still use many of the items they placed in their hope chests in my own home today: Desert rose dishes, McCoy vases, embroidered linens, aprons, a family Bible and, of course, photo albums. To celebrate the release of The Hope Chest, I'm asking you to help continue this beautiful tradition of family and heirlooms by sharing photos of your own hope chests (or family heirlooms) with the hashtag #TheHopeChest. Please share on my Facebook page, or your own, Twitter, Instagram, Pinterest, etc. (and make sure to tag me, or let me know you have shared a photo at contact@violashipman.com). I will pick a random winner from all submitted photos by midnight March 28 and send an autographed, personalized copy of The Hope Chest to you … with a special surprise! Pre-Order The Hope Chest now, and I’ll send you an autographed, personalized bookplate! For an author, pre-orders of a book are the equivalent of first weekend ticket sales for a movie’s release, the first week’s box office for a Broadway play, or opening day attendance for a professional baseball or football team. In short, presales of a book demonstrate surefire support of a book and enthusiasm. I’m hoping that you will consider ordering the book NOW from your favorite bookseller or bookstore, in advance of its March 21 release. AND IF YOU DO … Drumroll, please … I will send you an autographed, personalized bookplate for your book, which you can have on hand to place in The Hope Chest as soon as it arrives! 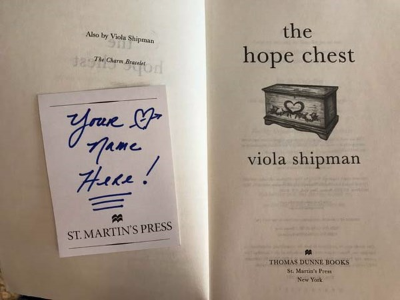 Just message me privately at contact@violashipman.com and send me your snail mailing information and to whom you’d like the bookplate personalized, and I will send a bookplate at no charge! In advance, THANK YOU for your support! A Recipe: My Grandma’s Favorite Cake in Celebration of Spring, My Birthday and Book Launch! I spent much of my childhood in my grandma’s kitchen. Her country kitchen was tiny but seemed larger than life to me as a child: A pink Formica table and vintage oven anchored the kitchen, while her sparkly countertops were engulfed by a bread box that held Little Debbie’s and Wonder Bread slices, as well as her old recipe box. Her recipe box was jammed with family recipes, most of which were written in her looping handwriting (My cursive looks just like hers and my mom’s). My grandma was an incredible baker: Her fresh fruit pies – apple, blueberry, cherry – won ribbons around town, the meringue on her lemon meringue was a mile-high and resembled a heavenly cloud, and her cookies were eaten before they cooled. Of all the recipes, though, one was my favorite, and it still makes my mouth water, my heart stop, my taste buds ache and my head fill with precious memories: Her Cherry Chip Cake. I asked her to make it for me on every special occasion, including my birthday (March 30) but, ironically, I could never find this beloved recipe. Luckily, I found a cake recipe that was as close to my grandmother's lost recipe that I could remember from CompletelyDelicious.com. In celebration of spring, my book launch and my birthday, I am honored to share the recipe with you. And I am thrilled to announce that the recipe will be part of my next novel, The Recipe Box, which will publish next year (I just finished it and sent it to my editor!). In the meantime – I hope you love this as much as I did! Honestly, it’s worth the time and calories! Here’s to books, cake, spring and family! Preheat oven to 350 degrees F. Butter and flour two non-stick cake pans. Drain the maraschino cherries, reserving the juice. Finely chop the maraschino and fresh cherries in food processor or with knife. Set aside.In a mixing bowl, beat butter and sugar until light and fluffy. Scrape bowl with spatula and add egg whites one at a time, mixing after each. Add vanilla and almond extracts and mix until combined. In a separate bowl, combine the cake flour, baking powder, baking soda and salt. In a smaller bowl, combine the buttermilk and maraschino cherry juice. Add the flour mixture to the mixer in 3 additions, alternating with buttermilk-cherry juice mixture. Mix after each addition and scrape down the bowl as necessary. Stir in chopped cherries. Divide the batter evenly between cake pans and bake until a toothpick inserted into the center comes out cleanly, about 30-35 minutes. Let cool in pans 10 minutes, then transfer to plates or wire rack to cool completely. In mixing bowl, beat butter for about a minute at medium speed. Add powdered sugar, and mix at low speed until the sugar is incorporated. Add whipping cream and cherry juice. Increase speed to medium and beat until light and fluffy (about two minutes). Place one cake layer on a plate or cake stand. Cover with 1/2 cup of the buttercream frosting. Place second cake layer on top and cover tops and sides with remaining buttercream. Ring top of cake with pitted, fresh cherries or maraschino cherries (I like both). The Charm Bracelet is now available in paperback! Since my debut novel, The Charm Bracelet, published last spring, I have been humbled, gratified and overwhelmed by its reception. This sentimental, family novel is about how the charms on a grandmother’s bracelet reconnect her to her daughter and granddaughter and remind them of what’s most important in life – family, friends, faith, love, and a passion for what you do in this world. And The Charm Bracelet has been embraced around the world as it has been translated into a dozen languages. And it recently was named a Michigan Notable Book for 2017 by the State and Library of Michigan. 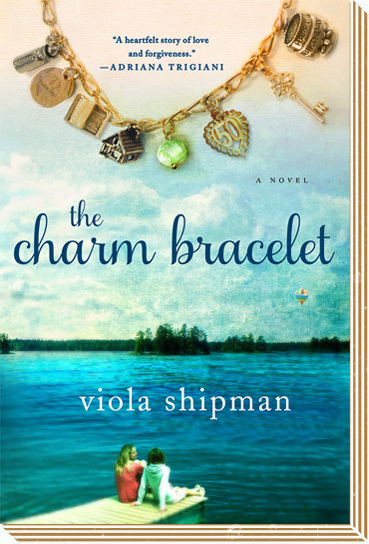 If you have yet to read The Charm Bracelet, or share it with your book club, I hope you will check it out and then share it with your book club. Let me know if you choose it for your discussion, as I would love to call in and Skype or FaceTime with your group. Visit my book club page, which includes contact information as well as a wonderful book club discussion guide for The Charm Bracelet. And the same offer stands for The Hope Chest! A Tulsa Literary Coalition & Magic City Books event. Books will be available for purchase at the event courtesy of Saturn Books. More dates are being added all the time! Visit my tour page for updated details. You are receiving this email, because you signed up to receive updates from Viola Shipman.